There are two tricks I like to use to help quit the assumption habit: assumption tracking and assumption blasts. Whenever there is a miscommunication, mistake, or misunderstanding instead of blaming or judging stop and ask: “What assumption led to this experience?” There is always an assumption behind chaos and conflict. Explore what assumption you made by looking back at the sequence of events that led to the current experience. You’ll soon see where you left reality and went into story. (Resist naming other people’s assumptions unless they are exploring with you!) 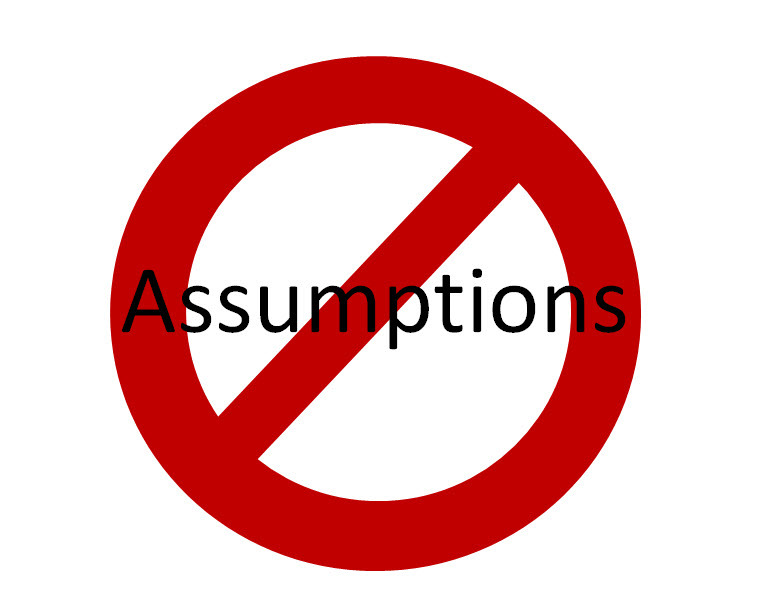 Tracking assumptions helps us to be more mindful of the consequences of assuming and can help us to stop the assumption habit in the present. 1. They are actually a professor at the local university who is studying homelessness. 2. They are not homeless, they just prefer to live in nature. 3. They are an alien come down to earth who is inhabiting the first person they saw. By doing assumption blasts regularly you’ll stop believing the first thing your mind latches onto and realize there are many possibilities for every experience and perception. And without the expensive habit of assuming, you’ll have extra change to spare on the things that really matter, like clear communication, truth seeking, and asking good questions.